My account has been banned, what can I do? 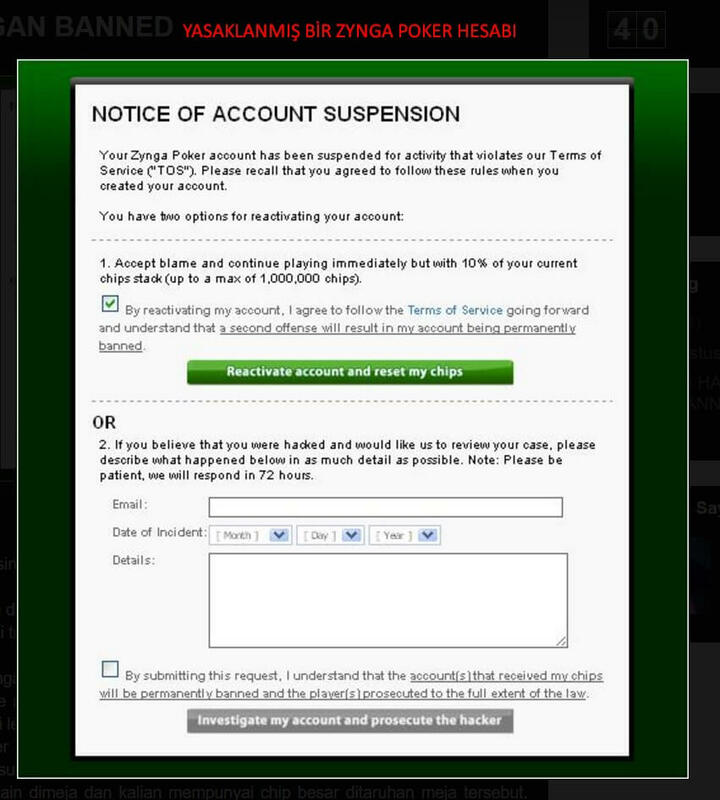 Because of unusual behavior that you make during Zynga Poker, your account may be banned. You can read our other article describing the situations causing your account to be banned and learn what to do to prevent it from getting banned. In this article, we will mention about other details on banned Zynga Poker accounts. Rule violations related to Zynga Poker accounts are carefully monitored by the system. Unexpected movements, repetitive process, higher sums chip transfers, and logging in to multiple accounts from the same IP are among violations of rules that often attract the attention of the system. As in any game or system, there are also a variety of results of violations of rules in Zynga Poker. Zynga Poker may ban your account in two different ways. The first ban applied by Zynga is called TOS. As you can see in the picture, by resetting the chips in the said account, you can reactivate your account. TOS is a warning that Zynga Poker gives you. It means that your inappropriate actions on the system have been noticed, that your rule violations have been detected and that you have received the warning by losing your chips. TOS is a situation where reactivation of your current account is possible but your account is closely watched. The slightest inattention or violation of the rules may lead to another warning or even a ban to your account. In such cases, it will prevent a possible ban or losing chips by getting a TOS again if you buy your chips, which is a rule violation, with a new account and with the guarantee of Pokerkedi.com. Because, when you are a TOS situation again, there is a risk for your account to get a permanent ban. Reactivation chance of the Zynga Poker accounts banned permanently is less than 1%. Another situation that you will encounter when you conduct a rule violation on your Zynga Poker account is a ban applied on your account. Reactivation of your account after the ban has a very small chance. It is possible to submit on Zynga Support for the account to be reactivated by considering every possibility. While filling in the form on Zynga Support, you need to explain your situation in detail in order for your account to be reactivated. Expressing the regret that you feel for your account getting banned and clearly explaining that you will not repeat your mistakes might be effective in reactivation of your account. Also, if you mention that you will do shopping on Zynga if your banned account is reactivated, it can be effective in reactivation of your account. You can find the detailed information about this topic in our article titled “Open the Banned Account". 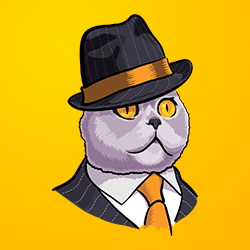 In case that your accounts conduct actions that violate the rules while transferring chips on the tables, automatic systems of Zynga detect those violations. A majority of the improper behaviors are also determined by these systems. After the rule violation is detected by Zynga systems, the account is given its first warning. The first warning is TOS and all chips in the said account are required to be reset in order for your account to be reactivated. If you agree to reset, your account is reactivated. TOS is a warning, and in case of repeat, your account is permanently banned. To avoid getting warnings and being detected by the system for rule violations, you can make your Zynga chip purchase transactions on Pokerkedi.com. All transactions that you will make on our web site are conducted professionally and your account’s safety is never put at risk. In addition, to find out what you can do with your closed account or what are considered violations of rules on Zynga Poker, you can check other articles on our web site. On our web site serving for your game pleasure, you can meet all your needs and learn everything about Zynga Poker accounts.